There was a bit of time for checking out some of the art galleries in Cornwall so this is a mini review. There is an awful lot of art around from the very basic cheap and cheerful canvas prints for the souvenir market to the tiny (relatively when you live near London) museums and the very many provincial galleries and working artists studios. I just touched the surface but a few things left an impression with me. Tate St Ives - I loved St Ives, loved the architecture of the gallery, position and vista but was pretty underwhelmed by the exhibition. I guess I'm not much of a modernist although I always try and keep an open mind. I contributed to the Roman Ondak exhibit where each visitor to the gallery is asked to stand against the wall in the gallery space and is then measured and their name and date written on the wall. You get a real sense of the visitors that had gone before and eventually a solid black band runs round the room but it could be a school project and in fact reminds me of what we all had at home where Mum or Dad charts the growth on the kitchen wall. Its it art? Mmmmm.....? Not so sure about a room of balloons capturing half the space although the families with youngsters seemed to enjoy it. Maybe the permanent collection would have been more my cup of tea. Newlyn Art Gallery and The Exchange - Well maybe I am a bit modernist after all because I enjoyed both of these. The Exchange is in Penzance and their Urban Silence exhibition captured my full attention. Its a group of Portuguese artists observations of megacities, social housing projects and squats where the focus is the buildings rather than the people. It was the videos that were most impressive, Mexico City from a helicopter, miles and miles of roof tops which never seem to end, Marvel City a newly completed housing estate outside Cairo completely uninhabited and without signs, cars and people, and a stroll round a social housing project in Portugal with a hand held camera. Thought provoking stuff. I also enjoyed artist Gil Heitor Cortesao's oil paintings on plexiglass, someone I have never come across before but the distressed chic and photographic look of them really appealed despite the fact I like paintings to look painted and not like photographs. Really its a wonder I bother to have any opinions as something always comes along to confound them! The Newlyn Art Gallery is a wonderful little space and the current exhibition of art inspired by the natural world brought together an interesting variety of artists. The stand out one for me was Chinwook Kim for the fine draughtsmanship and scale of the work. There was another artist I discovered on the walls of a hotel lounge whilst having a coffee, rather annoyingly I have forgotten her name and cant find any clues on the net - I'll have to go back. 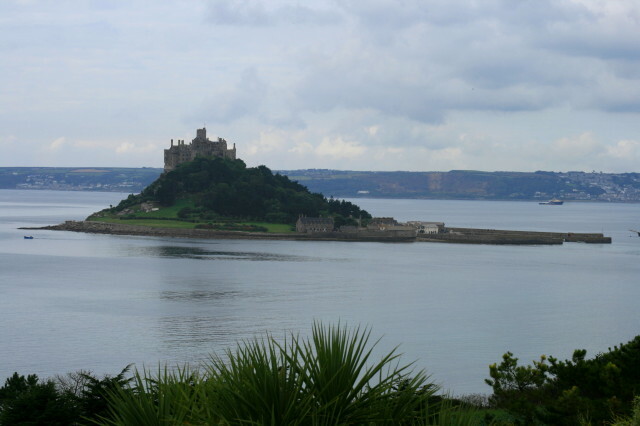 The views of St Michaels Mount from the patio of the same hotel were stunning too, a gem of a place in Marazion. Barbara Hepworth Museum - This was a fabulous little place, really tiny and special with great atmosphere and insight into her life and way of working. There is an impressive collection of her work some of which I think cry out to be touched which must be very hard for little visitors to resist. Well worth checking out. Driftwood Gallery Falmouth - A rather nice and impressive commercial gallery. They had a promotional day for one of their artists Henderson Cisz when I visited so the rest of the artwork was temporarily squeezed downstairs but I saw much that I liked particularly in glass, ceramics and sculpture. Oh and Rolf Harris is represented, he's doing some really nice work these days and I presume having some serious and much deserved success. One of mine and my kids childhood heroes. I'm not sure why I haven't been to Cornwall since I was a child but art aside I felt very at home there, seagulls, water, sand and big skies etc. I'll definitely go back, I may even emigrate!